Personal Injury & Estate Planning Lawyers Seminole FL | DeLoach, Hofstra & Cavonis, P.A. "I was well pleased with the way it was handled. I was kept informed. They treated me like anybody would want to be treated. I have really nothing bad I can say about it at all. The kept me up to date on everything...I'd recommend you to anyone." John B. The lawyers of DeLoach, Hofstra & Cavonis, P.A., have been representing Floridians in a wide variety of legal matters for over 30 years. From our conveniently located office in Seminole, we have been providing personalized, effective legal services for individuals and families all over west central Florida, including Seminole County, Pinellas Park & Pinellas County, Pasco County, St. Petersburg, Largo, Tampa and more. We are dedicated to not only offering premier legal services in the area, but supporting the community with our involvement in non-profit groups, volunteer organizations, and local events. The six attorneys who comprise our legal team bring years of experience and practiced skill to each case. 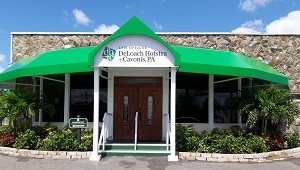 DeLoach, Hofstra & Cavonis, P.A., offers representation and guidance in legal matters related to real estate, litigation, estate planning, probate, elder law, and injury law. Whether you have an immediate legal need or you are simply planning for the future, our compassionate lawyers can help you and your families learn more about your rights in Florida, examine your legal options, and determine the best, most effective path forward. If you are in need of legal services in West Central Florida, call our Seminole office today at 727-397-5571, or take a moment to fill out our online contact form for a prompt response from a member of the DeLoach, Hofstra & Cavonis, P.A., legal team. We can answer your questions over the phone or schedule a consultation. At DeLoach, Hofstra & Cavonis, P.A., we are always working to improve the service we provide to our clients. Take a look at the feedback we have received from our clients on Google and Facebook! Client Reviews of DeLoach, Hofstra & Cavonis, P.A. "We've used the services of DeLoach, Hofstra & Cavonis for nearly 10 years, both personally and professionally with our small business. If you're looking for honest, straight-forward advice and consultation - Look no further. Additionally they have attorneys who specialize in just about everything you would need. We've worked with Paul, Peter, Dennis, and of course Rep and been more than pleased with their knowledge and professionalism. It's also nice when you can be on a first name basis with not only the staff, but the partners themselves. I know we often don't think about an attorney until we really need one, but I would recommend this firm above all else in the Tampa Bay Area. We would give 10 Stars if we could!" Our office is conveniently located at 8640 Seminole Boulevard in Seminole, Florida. Find us at the corner of 86th Avenue and Seminole Boulevard. Head South on US-19 Alternate. At the corner of Seminole Boulevard and 86th Avenue, our law office will be on the right. Turn left onto 1st Avenue. Turn right onto N. 58th Street North. Follow Tyrone Boulevard/US-19 Alternate North. Continue to follow US-19 Alternate North. Make a U-Turn at Porpoise Park Dr.